A few months ago I posted a recipe for Cherry Almond Upside Down Cakes...well it's time for a fall version! I first thought about trying to do this with pumpkin and pecans, but decided I just can't go wrong with apples and cinnamon. The recipes are very similar and super easy!! These have been a huge hit around here and do not last long after they come out of the oven! I suggest adding a scoop of my Dairy Free Vanilla Bean Ice Cream to the top of them while they are warm...yum! 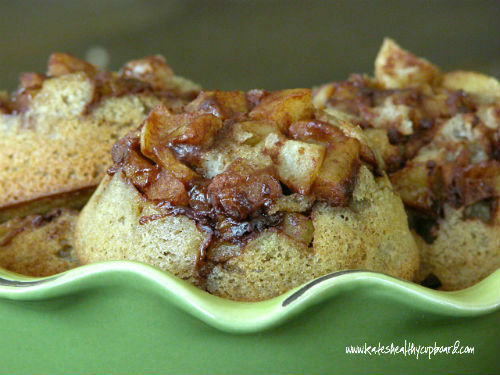 Pour the apple mixture into the bottom of 6 holes of a greased muffin tin. Remove from the tins with a big spoon. *I used Honeyville Almond Flour. these are already pretty moist so Bob’s Red Mill may make them REALLY moist but still delicious! Let me know which one you like better, the apple or the cherry. I can't decide, they are both pretty darn good!